A very good day to all Phuket Weather readers.... there seem to be a lot of people asking about the weather recently - I am getting emails, facebook messages and seeing questions on the travel chat rooms - the problem is that the common forecast sites such as the BBC, Yahoo or Wunderground (see links on left side of this blog) all seem to indicate rain or thunderstorms. In fact, the weather is warm and sunny, maybe a bit hazy, but pretty darn nice. Maybe some evening rain, but nothing to worry about. Yes, there is the chance of a thunderstorm, but a quick downpour at 8pm is unlikely to ruin your holiday. This means - might be sunny, maybe some rain, might be cloudy, we don't know. Whatever happens we can claim to be partially correct. The rain (if it comes) always seems to fall at the same time as I leave the dive center and get on my bike to ride home. Last night was typical - no sign of rain until 7pm, then all of a sudden, just as I mount my trusty steed, the rain starts a spittin'. Luckily it did not amount to much. This morning was totally overcast and rather hazy, but the sun burned through by mid morning. The day has been hot and sunny. See photo below grabbed from the Karon Beach Web Cam. 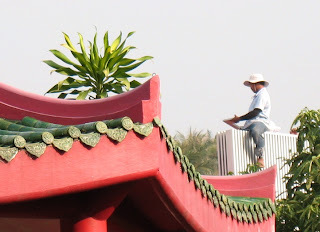 (above) Worker on the roof behind our little temple in Karon Plaza. Please do note that it's sunny and not raining or thundery. It was some 39 years ago that I saw the light of day for the first time. This suddenly seems like a very large number to me. Much larger than 38. I was 30 when I came to Thailand. Things like trucking across Africa and cycling the Pyrenees seem a long time ago. It was 17 years ago that I completed a Masters Degree in Forensic Chemistry. The years pass alarmingly fast. My little boy, born just 2 weeks after after the tsunami, he's going to start school soon. Now a suitable quote. We all grow up and get older, though we'd all like to be Peter Pan.